The ROARING FORTIES™ OCEAN PLUS life rafts are made to last if the proper maintenance & storage instructions are adhered to. They are available in various sizes 4 to 12 Person to ISO 9650 specification and 15 - 25 to USL Code. 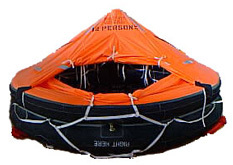 OPTIONS NOW AVAILABLE FOR 24 MONTH SERVICE ON ISO packed rafts! !